Our kittens Rosencrantz and Guildenstern (as Alekka finally named them, never mind that they are brother and sister) celebrated their 4-month birthday a couple of weeks ago. Maybe “celebrated” is the wrong word, because what it meant for our kitties was a spay-and-neuter party at Dr. Sisay’s Ody Mobile Vet clinic. The good doctor does house calls – that’s why it’s called a mobile vet – but because I didn’t fancy using our dining area as an operating room, we opted to have the procedures done at the vet’s storefront surgery. 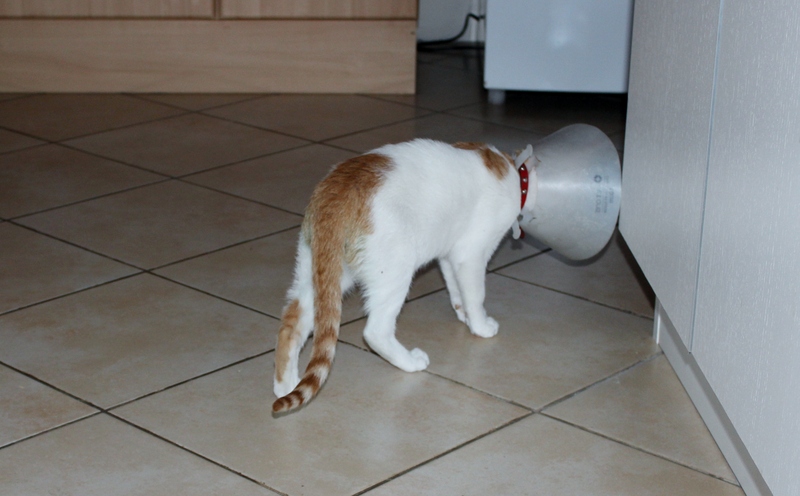 Rosie went first with no problems – until afterwards, when he was supposed to wear the plastic cone for two weeks. Bad enough the thing caused him to misjudge space and mass so he crashed into doorjambs and fell off chairs. But the worst part was that his sister Gil would have nothing to do with him. Every time Rosie and his cone came within 6 feet of Gil, she arched her back, fluffed up her fur, and hissed menacingly. Poor Rosie. He’d lost his only friend. Rosie bumps into the kitchen cabinet. A few days later we took Gil in to be spayed. Rosie got an unexpected reprieve on the cone (unexpected by us, anyway; Rosie probably assumed he’d have to wear it forever) when the vet informed us that the clinic only owns one cone. We would need to take it off Rosie and put it on Gil. We wondered if Rosie would hiss and run away from Gil the same way she did to him, but Rosie was surprisingly solicitous of his sad little sister. I thought maybe he remembered his own sorry coned condition and was showing empathy. But my friend Leslie in LA, who knows a lot about cats, pointed out that it was more likely that the now-familiar smell of the clinic and antiseptics didn’t scare Rosie any more. The two played together just like old times – enough that Gil’s stitches tore out and we had to separate the cats until both kitties were healed up. You’ve never heard such sad meowing. Gil kept up her regular bathing routine, but only succeeded in washing the cone. So, here’s an interesting feature of the spay and neuter process in Ethiopia – the vet offered envelopes containing the removed parts to Andreas when he went to pick up the kitties. Testes, Mr. Andreas? No? How about a couple of ovaries? Not sure if the gonads were intended as proof of the vet having completed the operation, or whether there was something we might want to do with the pieces. Andreas was too surprised to ask; he just told Dr. Sisay no thanks, he could keep them. 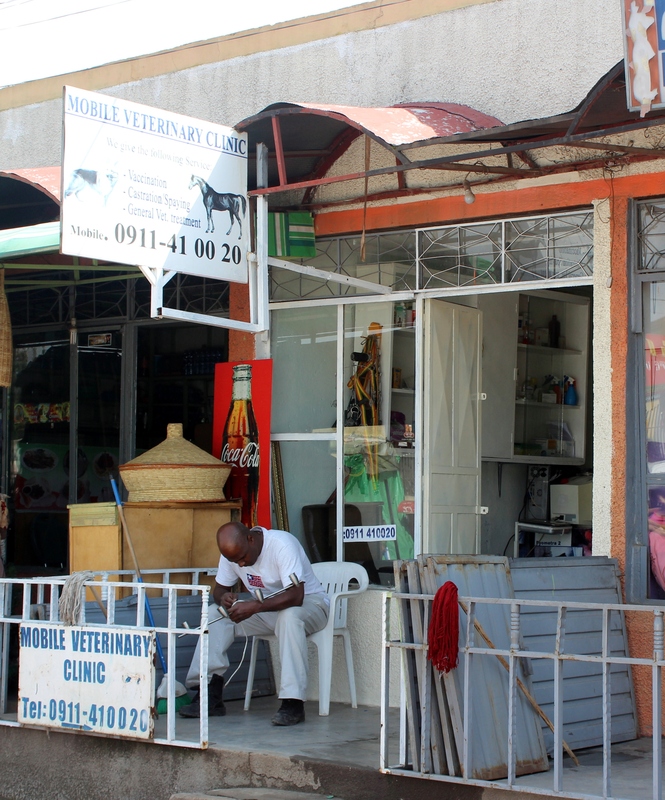 This entry was posted in Animals, Expat experience, Home life and tagged cats, pets, spay and neuter, vets in Addis. Bookmark the permalink.